I'm not sure whether to put this post here or on the F4 thread, move if needed, no worries. I have a question though about my 2000 f4. I bought her about 6 months ago and recently got intostunting pretty hard as my money finally allowed ffor it lol She had full fairings on and I only had frame sliders on (I know...) anyways ended up flippin her coming down on a wheelie, nothing wrong mechanically but the only piece repairable cosmetically is te tail fairing. The front is on but ugly, no side fairings. Gas tanks and clip ons levers all that are good. I'm planning on selling her as I want to go with the f4i as my stunter. 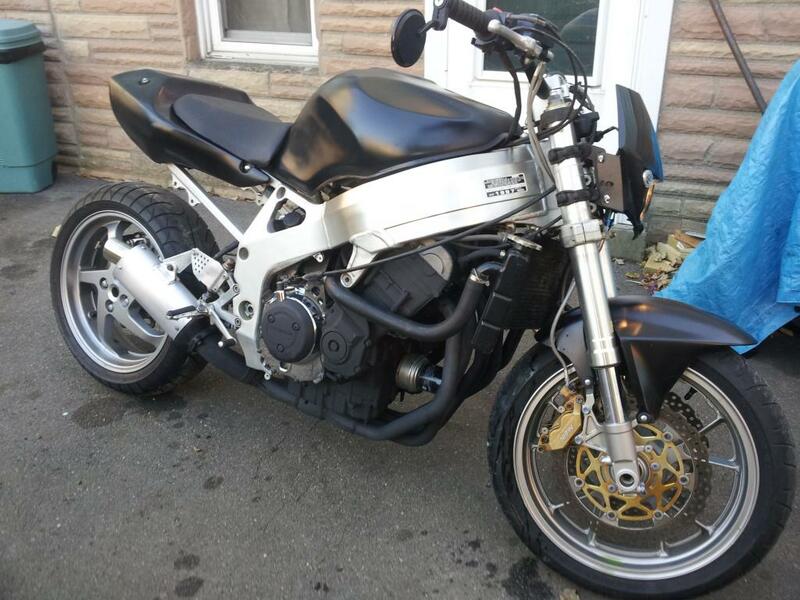 Now would I be better of spending the 300 for the fairing kit and selling it that way, or is there value as a streetfighter? I figure I could save money and just strip the front fairing and mount and just get a nice headlight and repaint the tail and tank. Give me your opinions please! If I turn it into a streetfighter I'm probably gonnahold on to her a little longer and get some use out of her looking mean, just a thought. it really depends. the market for your bike is shrinking as it gets older. if the person you're selling to wants a fighter - obviously having a nice front headlight on there makes it a great platform. however, if they want a full faired bike - they'll use it as a mark against it trying to get a lower price out of you. but going with aftermarket fairings is going to be a negative to both people. if you do replace the fairings, replace with used OEM off ebay. and just to richen up the conversation. its how many custom parts you have on your fighter.. full exhaust, custom rearsets, levers. people will know if its a bike that was well taken care of or just trashed around.. and in the end it still comes down to the buyers you find.. I doubt you'll find a buyer who's dying to buy something in January. personally I would take conrices advice and try to refit everything back to stock, but just try and shop cheap.. stuff will pop up on ebay, bid on it (if the price is right) and let it go if someone else bids on it too.. stuff always comes back up...bottom line, if you have the space and money to move onto something else while putting her back together. that would be your best way to go and by not being rushed you'll do it right and wont lose a penny..
edit: just wanted to add one thing, to sell her as a fighter can be a risky proposition. fighters are a acquired taste hence you'll need to find the right taste buds, because there are less of us out there and def more stock preferred buyers... you can spend thousands on your fighter build and it will still only be worth a couple thousand on the "real" market, unless you wait long enough for the right buyer.. jmho..
Last edited by jasonchristopher; 01-22-2013 at 10:04 AM. to sell her as a fighter can be a risky proposition. fighters are a acquired taste hence you'll need to find the right taste buds, because there are less of us out there and def more stock preferred buyers... you can spend thousands on your fighter build and it will still only be worth a couple thousand on the "real" market, unless you wait long enough for the right buyer.. jmho..
Haha I wish my bike was so well trained. I'd let her sleep in bed with me and my gf can stay in the garage. But I know what you mean about the connection. I just bought a project/parts bike (not sure where I am going to go with it). When I thought about fixing her up, I felt like I'd be abandoning Katrina. 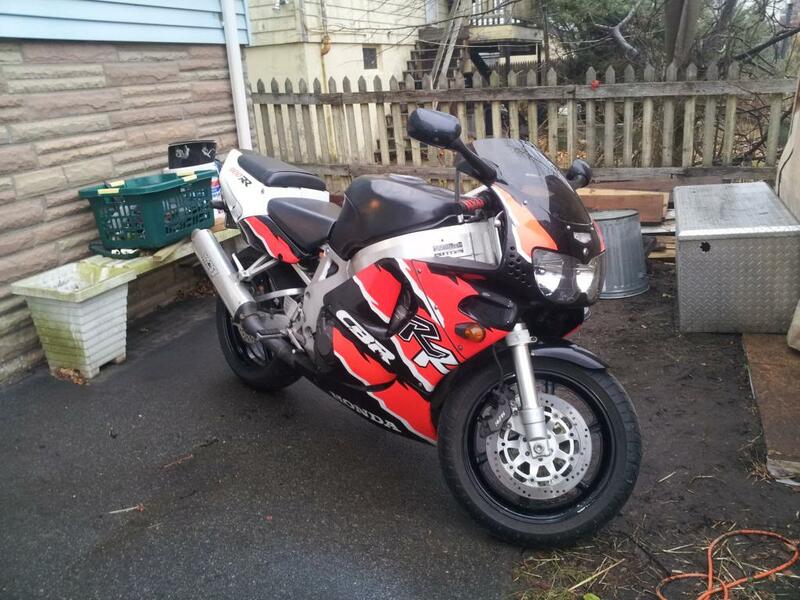 On the topic of my 'new' bike, when I found her online (actually the PO found me), he only had one picture, and it was hard to tell the true condition. He said it was a project, but near finished and a great bike etc... When I got there, I saw something very different. It was a hulk. That difference in opinion is also why I only paid half of what he was asking. On one hand, the F4i is a great bike and I'm sure you will enjoy her, but on the other, I can almost guarantee you will regret selling your F4 down the line. If it were me, I'd keep her! Redbaron: I'm going to throw up a couple pictures and try and tell you a short story.. its really a pleasure for me to tell. so here goes, i promise you'll enjoy it and maybe inspire you in some small way.. i know Conrice will certainly understand some of my thoughts here.. This is my nice pretty 11,000 mile stock 900 and when i take her out @ least once a month, its a drive down memory lane.. i own a few of these and owned one of the first ones back when they were first sold..
Now when i take this bike out, memory lane is thrown out the window.. when i pull up to freinds and people i know, their eyes pop out of their heads and their like " what is that"??? is it a ducuti??? my god! ive never seen anything like it!! and this is when i start to say: AND YOU WONT!! and that never gets old... i love being able to say its a custom bike and its mine..people who know me, especially the ones who known me for more than thirty years, all say the same thing, you better never get rid of that bike"you look wayyy too happy on it!! you can go out and spend almost twenty grand on a rice rocket today and i have to say: you can also just keep what you have, strip her down and make her your own and the feeling of pride between a store bought bike and a self built bike, there really is a difference.. and once you get that feeling, i seriously doubt you would drop that kind of money on someone elses vision. to only, not be able to fund your own!!! I say keep the F4, its unique than the F4i, people will expect and F4i and the only thing that it cant do that the f4i can is a PC. The motors are even interchangeable with a bit of work! Hell if you bought throttle bodies and a new wiring harness /ecu you could make it FI if you wanted to. Something that I have gathered as a spectator - and someone who has the taste just not the space - people who build Streetfighters arnt going for mainstream. Edit: Jason have you thought about getting some samco hoses for your rad? That would be sick!